Natural Selection described as “the differential survival and reproduction of individuals due to differences in phenotype” or alternatively as “survival of the best adapted”. It is also supposed to be a “blind, mindless, and purposeless environmental process” that hypothetically turns random genetic mutations into superior new features enhancing descendants’ survivability. Accumulation of these features supposedly turns one life form into another over time. 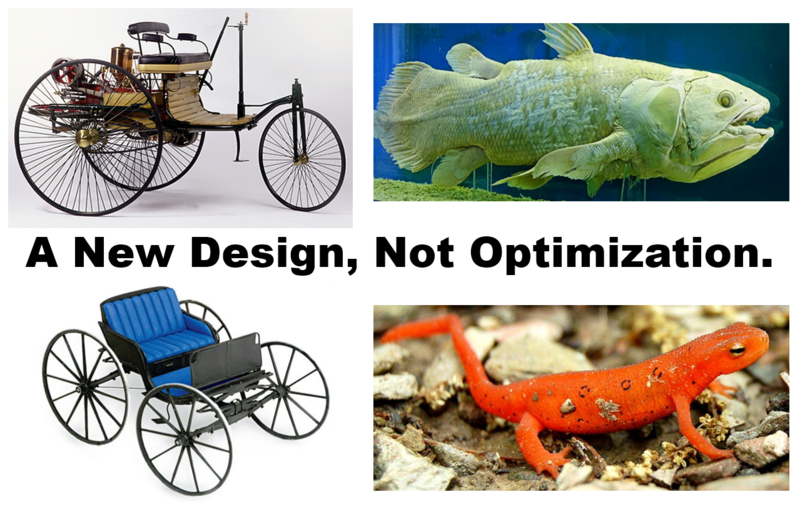 Natural Selection seeks to explain the appearance of design in nature without appealing to a designer. The ‘Natural’ qualifier is arbitrary (Darwin used domestication examples) and “blind, mindless, and purposeless” are all impossible to prove in addition to a process being a set of steps taken towards an end, hence incompatible with “blind, mindless, and purposeless”. But can the Natural Selection concept survive even after these excessive claims are removed? Natural Selection fails since survival is not directly tied to phenotype and “survival of the best adapted” is tautological. In a small farm, only organisms closely related to their wild cousins survive, but agribusinesses select for chickens with oversize breasts and research labs select for populations with specific genetic mutations requiring tight environments to survive. As shown, all these different organisms may or may not survive regardless of their phenotype. The only measure of “selection” is survival – we only know if and organism was selected if it survives and reproduces. “Best adapted” is also unknowable separate from survival. Survivability is a recurrent function of genotype, an infinite continuum of environments, and other unknown factors since phenotype is the unstable infinite set (hence unknowable and theoretical) of observable characteristics determined by genotype and the environment while genotype is a recurrent function of previous genotypes, environments, and other factors. While survivability can be measured as can be the individual genotype, measuring a population’s genotype is daunting at best, and the impact of the ever changing environment is simply impossible to evaluate. We do see genetic mutations (unknowable if random) and we do know that, given a similar environment, extreme genotypes reduce survivability, yet we also know that a large variety of genotypes survive just fine in any population. Fitness is never defined independently of survival – this renders the fitness concept redundant especially since survivability can be measured while fitness cannot. Evolutionary Fitness is defined as the quantitative representation of natural and sexual selection (reproductive success) of a genotype or phenotype in a given environment. “Survival of the fittest” is interpreted as: “Survival of the form (phenotypic or genotypic) that will leave the most copies of itself in successive generations.” Not only is survivability the only measure, but survivability also changes with the environment. Plant and animal breeding is not the “artificial selection” described by Darwin and has nothing to do with any natural process. Breeding requires a desired outcome, selection (just a minor step!) and isolation of successive generations of promising individuals, active mating or artificial insemination, optimization of growth conditions for the selected individuals, and/or other genetic technologies. Without most of these active steps nothing happens. Chihuahua and Poodle have no superior survivability to common dog or wolf, but happened anyway because humans worked hard to make them possible. But no one ensures all these active steps in nature. To take only one example, how could humans have “evolved” distinctly from chimps when no one separated each and every new generation based on a teleological model? Why did the proto-human not mate back with his/her regular chimp cousins to put an end to the split? Who and how could have separately optimized conditions for both chimp and human so both lineages survived in what looks like very much similar environments? ‘Selection’ of both “artificial” and “natural” type is thus the wrong word and should be phased out. Natural Selection is Intelligent Selection which is always done by an Intelligent Selector such as Darwin’s breeder which is an intelligent and willful player that takes intentional actions to reach preset goals. Predators, plants, birds, insects or bacteria, all show intelligence and the willful pursuit of predetermined goals. When interacting with the inert environment, organisms self-select rather than being selected by this environment. As soon as the organism dies and becomes part of the lifeless universe, all selection of that entity ceases. Rocks do not select each other, do not self select and are not selected by the environment. Selection is limited to a narrow set of possible adaptations – what is not there, cannot be selected. Among the most common adaptations are body color/size/shape, hair type, antibiotic/chemical resistance, and behavior, and even these are limited in scope. Farmers would like to grow walking chicken breasts the size of hogs that grow much faster and come in various flavors, but this is not happening despite their best efforts. Antibiotic resistant bacteria still cannot survive extreme temperatures and chemical concentrations and their resistance decreases when the stimulus is removed. Rabbits cannot turn green when hopping over grass and white just over winter, despite the clear advantage such camouflage would bring. Size of tails, horns, beaks, trees, etc. are all stable over time as tradeoffs limit their growth. Human intelligence, flying, swimming, venom, and all other desirable capabilities remain restricted to specific organisms. Both Natural Selection and [supposedly random] Mutations utterly lack creativity, therefore cannot explain the variety of organism designs. Domestication is the most sustained selection effort and has greatly helped mankind’s progress, but it has not changed the nature of the target animals and plants despite the intensity of the efforts to accelerate their evolution. Instead, humans only enhanced the built in characteristics of domestic organisms and simply did without – a huge civilization disadvantage – when those plants and animals were unavailable. Experiments clearly show that selection does not design, is limited in scope to a few available characteristics, and is reversed as soon as the selection pressure ends. We do not observe “divergence of character” – instead, we see limited variations around a mean (regression to the mean). Take bacteria with a reproduction rate of 20 minutes. A very long e-coli experiment (R. Lenski LTEE) has been running since 1988 (millions of human-years equivalent) and has produced a citrate-digesting e-coli strain as well as faster growing e-coli, but not a single bacteria that can be labeled anything other than e-coli. Had the most divergent descendants of this experiment been released into a generic e-coli population, its characteristics would most likely wash away – a reversal of variability disproving the “divergence of character” hypothesis. The simple fact that we can identify a bacteria as e-coli (or a primate as a chimp), instead of something on a continuum, shows that “divergence of character” gradualism fails. Extinct organism were not flawed and their features were not “selected away”. Most characteristics of the extinct survive just fine in current organisms. Sure, the mammal eye might provide superior vision to insect eye, but nothing comes for free and tradeoffs ensure both survive. Organisms that have completely vanished cannot be characterized as flawed and it would not take much imagination to see them thriving in a current landscape. The environment may have changed dramatically over time, however on a macro scale, the environment affected all organisms making the “natural selection” explanation highly doubtful regarding why some organisms survived in their old form, why some went extinct and why others would survive in a changed form. Humans and apes shared the same environment in Africa so common genotype would not have caused our dramatic differences just as lions are not that different than leopards, cheetahs and others. What if anything should replace Natural Selection? Humans have applied the most intensive and targeted selective pressure on us and others with great results for our existence. Yet we have not transformed even one organism into another. Our dogs are still basic canines and our cats are still basic felines, not much different than their wild cousins. If anything, we had to adapt to them rather than them to us. The finch, the moth, the antibiotic resistant bacteria are still the original organisms, their hailed changes having reverted or proven simple adaptations. We are no smarter, more powerful or longer living (in absolute) than out primitive ancestors. Selection is not transformative, much less creative. If it were, then Intelligent Selection might be a good replacement concept. However, since species transmutations as imagined by Darwin remains unproven, the idea that selection of any kind has transformative superpowers must be discarded. Humans would apply the Natural Selection method if feasible, but we don’t because it isn’t. A Natural Selection software would use a random generator and a selection criteria to maximize survivability in an available niche. For instance, a family vehicle should optimize the transport function (survivability) given a set of environmental constraints (regulations) and an existing design as starting point. Random minute changes could be tested and retained if the transport function is improved. However, this method can only remove minor oversights but will never create any new designs. Any significant departure such as a new fuel, material or environment either results in a suboptimal design, or requires a cascade of changes to improve the survivability function. That is why the auto industry, like most other industries, introduces minor redesign annually and major revamps every few years. And while even the minor improvements must come in harmonized packages rather than one off (to reduce negative ramifications), in the absence of those major redesigns a firm would shortly go extinct. What is that biologic entity’s phenotype? What is its fitness function? What is the relationship between its phenotype, environment, fitness, and survival/reproductive success? Con: Chemists could say rocks DO “select” each other as in “bubbles go up and dust settles down”. Pro: Yes, “bubbles go up and dust settles down” and chemicals react with particular other chemicals because something else causes that, not because they “select” each other. Pro: Survival of descendants is the ONLY thing out there, not “fit”, not “best adapted”, not “selection”, not “beneficial mutations”. To see this, imagine an experiment where you want to determine one of those four without any information whatsoever about survival of descendants. Can you? No way! Even the improperly called “artificial selection” does not become effective until survival is affected. Until then it’s just an empty declaration of intent. Pro: Sickle cell occurrence of 10-40%, in equatorial countries of Africa is not “selection”. Even 100% occurrence would not be selection of any kind. Who/how/whom would be selected? The malaria doesn’t select, the mosquitoes do not select and humans do not select. What selection are you then talking about? How would you even test “a survival advantage”? Compared to what? Remember that 60-90% of the population in those areas does not have sickle cell and they survive. Pro: Antibiotic resistance is only subject to intelligent selection (itself or the defending organism) and is fully reversible when the stimulus is removed. It is also impotent in transforming those bacteria into any other organisms. Both antibiotics and antibiotic resistance are part of the biologic arsenal together with other BUILT IN adaptation capabilities like appearance, metabolism, etc. They are all limited in scope and reversible when the triggering stimulus is removed. No “divergence of character” seen. Sickle cell is a trade-off mutation like all mutations. When you examine closely, you see no such thing as “beneficial mutations”. I don’t know the true story of the “nylon eating bacteria”, but I bet that’s a trade off mutation also. Same goes for Lenski’s citrate eating eColi. Just mix these with the general population and remove the stimulus and you should see these trait disappear rather than spread to the whole population as promised by Darwin. Who knew “evolution” was testable? The Darwinist trick revealed: it’s a known fact that the human brain has a tendency to make up “explanatory” stories for past events. But the predictive power of Darwinism is zero. I give you three phenotypes. Which one will survive? You don’t know prospectively but you do know retrospectively. Only retrospectively. Always. Keep in mind the chicken flu can hit too, and then none may survive on the farm. It’s always retrospective! Con: The popular definitions (for “natural selection”) are terrible? I’d go with “differential reproductive success causally correlated with genotype”. Pro: This definition fares no better as we’re all different and some survive making “differential reproductive success” an irrelevant triviality, the environment and other factors such as epidemics that can wipe out the population are left out, and “causally correlated” has to be independently confirmed since correlation cannot infer causality (and once causality is known then correlation becomes more or less irrelevant). Also aside from very specialized labs, all others select on phenotype, not on genotype. Con: Why are definitions so important to you? Pro: Hard sciences like physics and chemistry (includes genetics/biochemistry) are clearly defined, precise, measurable, and repeatable (this may exclude some cutting edge research areas). Soft sciences like economics and sociology are iffy but still clearly defined even if not too repeatable. Fake sciences like “evolution” and astrology are just stories that can never be verified or pinned down. If you claim to be a “real science” then you need to be clearly defined, measurable, repeatable, etc. Con: You have argued that because phenotype can’t be absolutely quantified to infinite accuracy, we can’t study phenotypes, and that because we can’t absolutely quantify fitness, we can’t study fitness. Pro: It’s not about accuracy. Take the zebra stripes – just one element of the infinity of their phenotype – yet we’re still guessing why: https://www.livescience.com/49447-zebras-stripes-cooling.html . Are the stripes essential to survival? If not, what other phenotype elements matter to zebra survival? Would they survive somewhere in South America? Where? Would a horse survive where zebras live? What kind of horse? You must agree we can’t say anything about how and why the zebra phenotype happened. Also you can’t say anything about their “fitness” and what would change their “fitness” and how much. More or less, all you can do is observe they survive. No! You can’t “estimate all those things closely enough for practical purposes”. 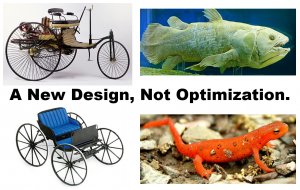 Con: What about organic design? Isn’t that natural selection at work? More and even more. Con: You just don’t understand natural selection? Posted in Views and tagged fitness, natural selection, phenotype, survivability.